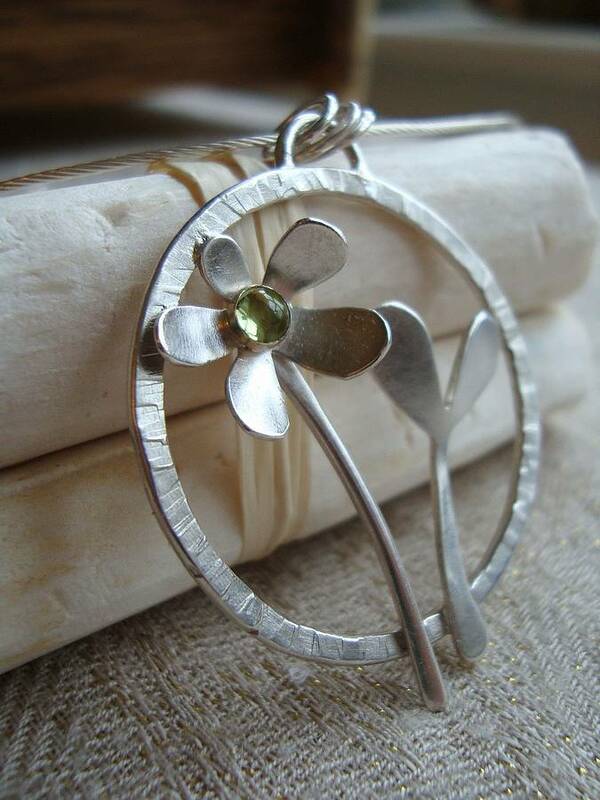 This handmade silver peridot flower necklace is like a little reminder of Spring to wear all year round! Perfect for nature and garden lovers. This beautiful spring flower necklace has been handmade by me, Caroline, at my workshop in Hertfordshire. This necklace is really eye catching, the bright green peridot is perfect to brighten up the dullest of winter days! This lovely necklace comes gift wrapped and is ideal to send straight to someone for a last minute gift. This is not too heavy so you could easily wear it for everday, but it does work equally well for special occasions such as wedding days, or as a gift for bridesmaids. The stone shown in the images is peridot, a semi precious gemstone. If you woudl prefer a different gemstone, perhaps a birthstone for a special birthday then please don't hesitate to get in touch. The necklace can be personalised with a stone to suit any occasion or in any colour. 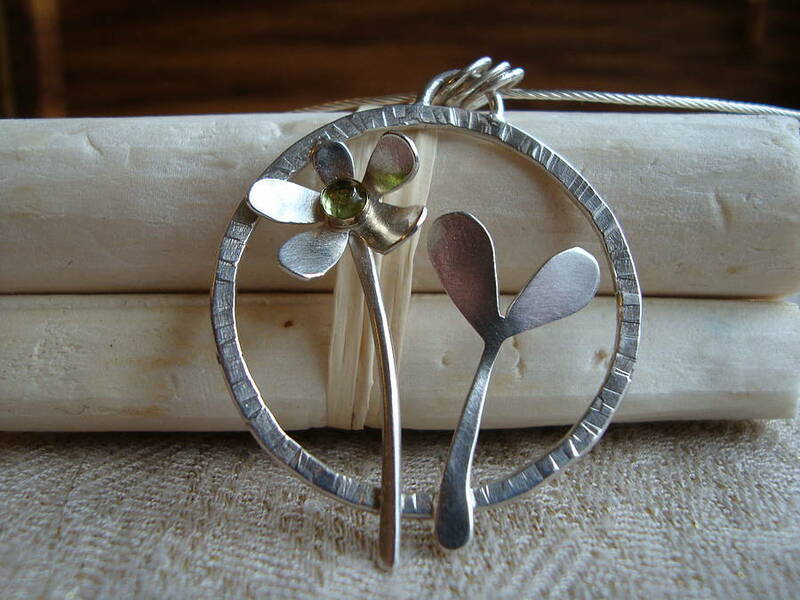 The pendant has been hand made by hand cutting flower and leaf shapes from a sheet of sterling silver using a very fine sawblade (not any easy task, I usually have a nice collection of broken sawblades on my workbench at the end of each day!). 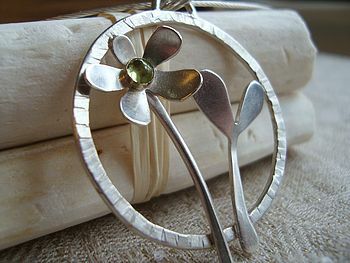 A pretty green peridot gemstone has been set into the centre of the flower. The pendant is suspended from a silver omega necklet in the images shown, but can also be supplied with silver snake chain instead. 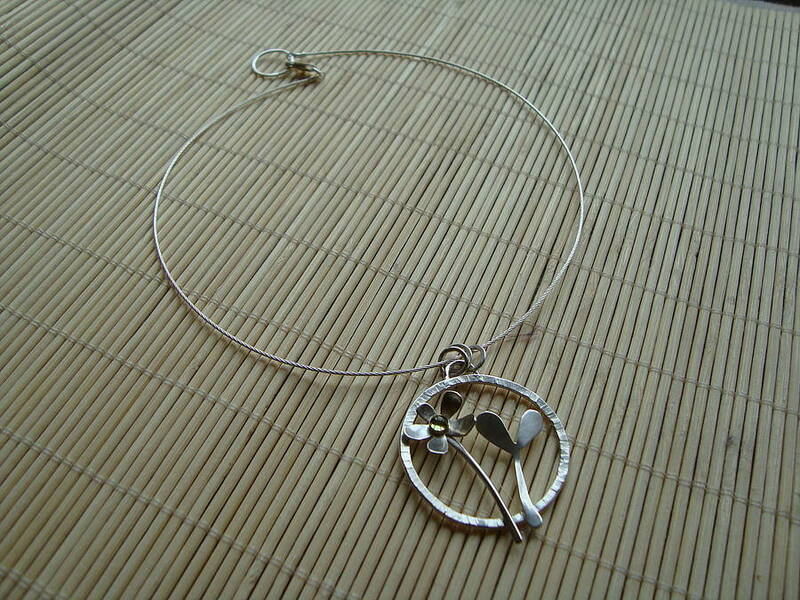 The pendant is suspended on a 16" sterling omega necklet and is approx 4.5 x 4.5 cm. Different chains available by request. This necklace is handmade to order and may vary slightly from the images shown; this makes each one truly unique! This product is dispatched to you by Caroline Cowen Jewellery.